I had an opportunity to be in the audience for the taping of the debut of "Point Taken", a new weekly PBS television show produced by WGBH in Boston, which promises to deliver reasonable dialogue about current events without all the noise. If you've been following my blog, you know by now that I am all about that, so I was pleased to accept the invitation. I'm always interested in seeing how the sausage is made, and the invitation required only that the audience be prepared to sit still for at least two hours (which meant that bathroom breaks or early departures were out of the question). I can do that. The premiere show, edited down to thirty minutes, was airing at 11 PM that same night, and since a lot of things were at stake here - like potential or continuing sponsorships, and syndication - the producers were under a considerable amount of pressure (and a hard deadline) to get it right. We (the audience) were seated very specifically by some optics-algorithm I was unable to comprehend. Once seated, we were directed to practice laughter and applause by the stage manager, as other production folks got their camera shots and angles just right. This all took the better part of an hour, until the director, hidden away in another room, was satisfied. The host, Carlos Watson, appeared, the guests were seated and introduced, and after a couple of false starts and re-takes, the show began. When I watched it later on television at home, the production was flawless. 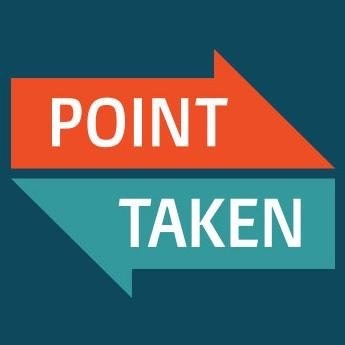 I recommend "Point Taken" to you - it's available to stream here. And look for me - I'm the tall guy with the white hair in the second row, on the right hand side of your screen. For about two seconds.